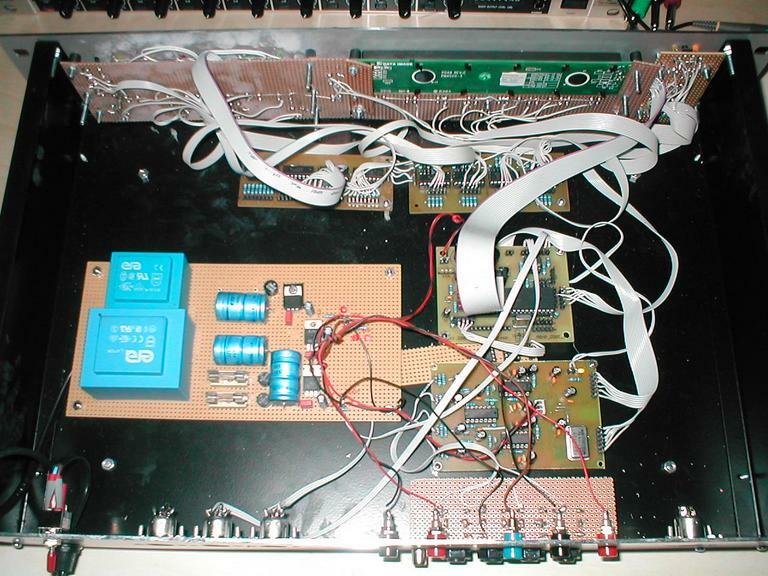 MIDIbox FM utilizies the Yamaha YMF262 sound chip (also known as OPL3) for generating the famous FM sounds known from Soundblaster (compatible) soundcards of the early 90s. 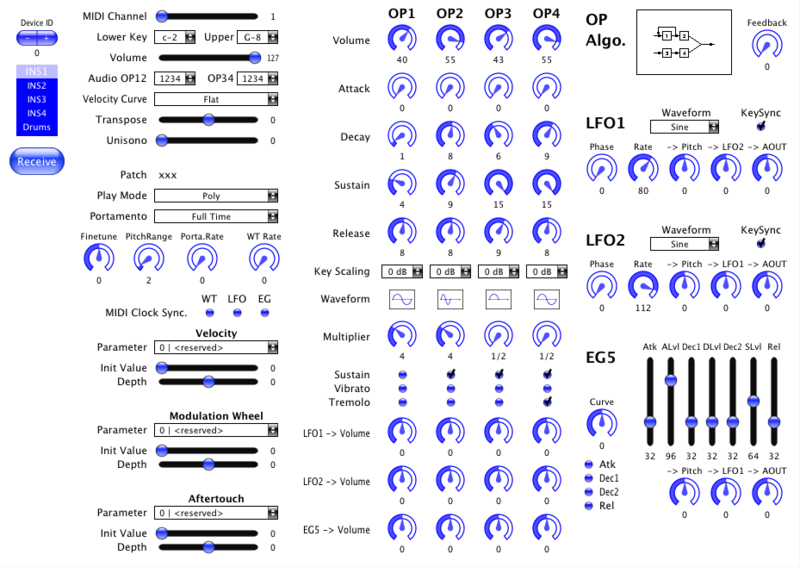 In addition to the OPL3 specific features (6 four-operator voices, 5 percussion instruments) some software implemented modulation sources have been added to allow more expressive and very experimental sound creations. each BankStick can store 128 sound patches, 16 drumsets and 32 ensembles. Most of these samples don't reflect the typical OPL3 sound, but should demonstrate the possibilites of the MIDIbox FM in conjunction with external Fx gear. The very first demo song. 4 voices are playing an E-Piano like sound, the morphed arpeggio sequence is played live with the MIDIbox SEQ. From 0:00-0:32 you will hear the raw sound output of the OPL3, at 0:34 it has been enriched with a chorus and delay effect. Some random patches which have been created with the mk_fm_random.pl script - they demonstrate the possibilities of the mighty MIDIbox FM sound engine. The stereo effects are realized by playing the same patch with four instruments. 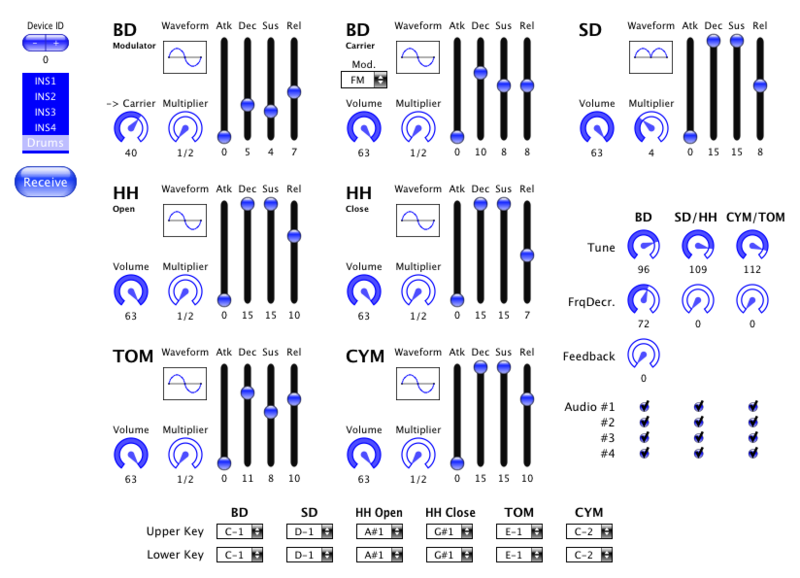 If the wavetable sequencer or the LFOs are in freerunning mode, the output of each instrument sounds (very) different. The outputs are routed to separate audio channels, which are placed at different panorama positions in the stereo sum. An external delay effect has also been added to improve the results. A demo which uses MIDIbox FM + 4 MBHP_AOUT_LC modules + 4 CEM3378 filters - my current setup. See also this forum article. Burypio created some tunes with OPL3 typical sounds, see this forum article. MIDIbox FM can be extended successively from a simple synth module without LCD and control elements to a complete rack (or desktop) unit with control surface. Sounds can be played once the MBHP_OPL3 module has been connected to the MBHP_CORE. All parameters can be edited with the SysEx editor in realtime from a Windows/Mac/Linux computer. A BankStick is highly recommended, otherwise only one patch, one ensemble and one drumset can be stored in the internal memory. Wavetables can only be stored in BankSticks. Note also that up to eight BankSticks can be connected - the large storage is especially useful if fast access to the preset banks is desired. Each BankStick can store 128 Soundpatches, 16 Drumsets and 32 Ensembles. The next extension step is the use of one 2x40 LCD + eight softbuttons + one ESC button + one CFG button + four Instr/OP select buttons + 10 LEDs + one data dial (rotary encoder) - this enables you to edit all sound parameters directly on the device. One MBHP_DINX4 module and one MBHP_DOUTX4 module is required to interface these parts to the core. The last extension step is the use of four V-Pots + the 6+4 buttons and 6*4 LEDs of the selection matrix. No additional DINX4 or DOUTX4 module is required for this extension. Please read also the MIDIbox FM Manual which discusses the details of the user interface! Below a list of the complete "MIDIbox FM" - costs can be reduced by choosing cheaper buttons, a cheaper case/panel and by organizing collective orders in the MIDIbox Forum! PSU +/- 12V Any hint? I'm using a 2x12V transformer which was really cheap, but tinkering with high voltages is only suggested for electronic experts! Please inform me about cheap alternatives! ??? Inside the original MIDIbox FM - more pictures can be found here.